Now this is one of those frustrating situations for the Vinyl Junkie (such as myself) here is an amazing audio beauty but it's One volume of a Three Volume set [sort of] OUCH it's half tease and a third job left undone, ya can't really settle it up in the collection. Wait you mean that you don't carry a piece of paper with names of Lp's you want um...you don't know what i mean by hunger..
Why you walking away .... hey come back at least check this out... it's J.R.R. 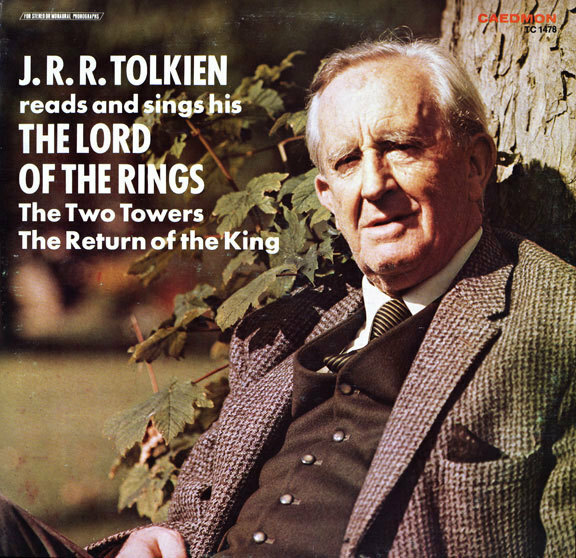 Tolkien reading and Singing his Lord Of The Rings: The Two Towers/The Return of the King it's a magnificent piece of audio and was recorded before the books publication.On this Lp Prof. Tolkien reads from his notes for the books as well as sings and chants verses of prose in elfish!, read the books in High School but I'm not a big LOTR fan boy by any stretch yet this recording always amazes me. Thanks to share your LPs. hey record bro. this is off topic, but you (and your readers) came through really quick with 96 tears. i've also been looking for walk away renee by the left banke. any chance a brother can hook a brother up? Strange, but very good site u have... kind of stumble in here... in the pursuit of J.J.R.TOLKIEN... I'm not a fan but I liked the books when I read them 30 years ago... and I'm curious about the man behind the storys... btw thanks for sharing... obviously ur into vinyl, well, I've got a challenge for u... in the mid or late 60-ties(?) I had a LP called "The Zodiac" or something similar, with some strange music on it... unfortunately I lost it on the path of life but my mind didn't... so untill we meet again... Hej då! I live with a Tolkien freak: she reads the trilogy every year. So this was much appreciated. I didn't find the downloads particualrly slow: but all downloads can be crazy-slow with Firefox. Thanx for the sharing, mister! Brilliant! I'm a mega-fan who will deny being a nerd, but I must admit I cryed a couple of times during the moving speeches. thanks very much for posting these. treasures they be, yes, precious. I'm currently working on a project recording songs from the African Veldt from my mom's old 78s. I'm sure you wouldn't be interested in those, so I have nothing to trade, but I really appreciate you posting these. Thanks again! Just FYI - that material is available on CD: "The J.R.R. Tolkien Audio Collection". Amazon has it. hey, I have the same reccord, as well as the edition he did of the fellowship of the ring and the hobbit. I'm trying to find out how much they're worth, any idea? There's a CD set from Caedmon (on Amazon, etc.) that I think is a reproduction of the boxed set that this album came in. I have the boxed set on LP, but (like many!) no longer have a record player to play them on, sigh. The Amazon listing also has reading from The Silmarillion that Christoper Tolkien did.